Excited to see the new Aladdin live-action movie? 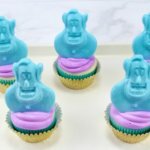 Celebrate with these fun Blue Genie Cupcakes. In a microwavable bowl, add about half of the chocolate discs and melt according to package directions. Spoon melted chocolate into the molds and tap the mold on the counter a few times to release any air bubbles. Let dry for about an hour or freeze for about 15 minutes, until hard. Pop genies out of the mold and repeat step 1 and 2. Add frosting to a piping bag or baggie. Snip off the corner and pipe frosting on the cupcakes. Place one genie on each cupcake. Add a little extra frosting behind the genie to help hold it up.